Sarah Bill has been a technical writer since 2007 for a leading natural personal care company based in Durham, N.C. Bill is also an extreme sports enthusiast and she skated with the Carolina Rollergirls from 2006 to 2009 as her alter ego, Billy the Kid. Colostrum and milk are both produced by female mammals to give their babies the healthiest possible start to life. While each of these substances is integral to infant development, they are different in composition and provide individual benefits. Both colostrum and milk aid in protecting children from disease, are easily digestible and enhance cognitive functions. 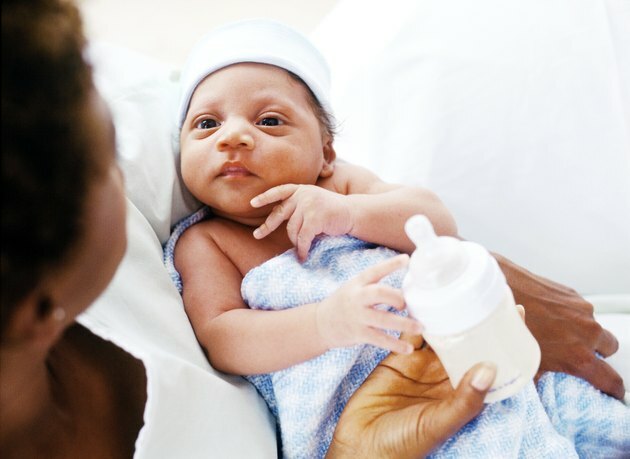 According to its Healthy Children website, the American Academy of Pediatrics describes colostrum as a thick, concentrated form of milk produced by expectant mothers in the days leading up to birth. Newborns that nurse in the first few hours after delivery receive the greatest benefit from the small amount of colostrum that is generated. This yellowish substance helps to develop the immune and digestive systems. Colostrum gives way to transitional milk production two to five days after birth. Transitional milk is cream-colored and generated in much higher volumes than colostrum. Mature milk comes in by the end of the second week after delivery; this milk is thinner and clearer and is produced according to the demand of the infant. The makeup of colostrum is quite different from that of breast milk. It is higher in protein, with less sugar and significantly less fat. Infants may lose some weight in the first few days after birth due to the low fat content. The purpose of colostrum is to deliver antibodies and immunoglobins that are responsible for boosting the immune system and preventing disease. Mature breast milk plays a different role. It contains proteins to aid in digestion, fats for brain development and lactose for energy. Milk also has both fat- and water-soluble vitamins that vary in type and amount based on the mother’s diet. According to an article in the "Pediatrics" journal, the advantages of breast milk "include health, nutritional, immunologic, developmental, psychologic, social, economic, and environmental benefits." Infants who are breastfed have a lower rate of infectious disease and obesity; in addition, breastfed infants may have slightly higher cognitive abilities as well. Colostrum itself provides additional benefits. It has a laxative effect that helps babies pass their first stool and also coats the intestinal tract to protect it during future feedings. Colostrum’s antibodies act as a natural vaccine for common germs that infants may come in contact with in their first days of life. There is a demand for colostrum and breast milk for babies who are unable to get these benefits naturally. Mothers who are either not able to produce milk or have conditions that prevent them from breastfeeding can access milk through donor banks. These facilities collect extra breast milk from lactating mothers and process it for distribution to infants in need. Additionally, bovine colostrum is available for human consumption as an over-the-counter supplement in capsule form.